I'm looking at getting a 24 week Ironman programme from Training Peaks. Just curious if this can be automatically populated into the planned workouts on the TP calendar? Also, I assume it will require a premium subscription. I have 'bought' the free sufferfest programmes and they populate fine and I have a free account. I've just started noting my TSS weekly. Would I be right on saying I should use it to factor in easy weeks? Basically, when I come out this four week block and into my next recovery week, my form (TSB) is going to shoot up, which (hopefully) means I can start to log some longer hours/harder sessions and see that CTL (Fitness) increase to somewhere approaching 100. Now then, how do I use TSS effectively if I’ve only got the basic version? It doesn’t give CTL, TSB etc. jibberjim, or stenard, may come along shortly to correct me? But, from reading the extensive TrainingPeaks blog, that's what I learned yesterday. Do you have a Chrome browser? There is an AWESOME extension called "Elevate"
This calculates figures similar to TrainingPeaks and is 100% free. It isn't a good, but it is very decent and way better than Strava for this. In theory, your maximum TSS for one hour of exercise is 100. If it is more than this, your FTP is incorrect. Somewhere on here (iirc) there's a lik to an Excel spreadsheet that calculates CTL, TSB, etc from the TSS values you get from trainingpeaks. 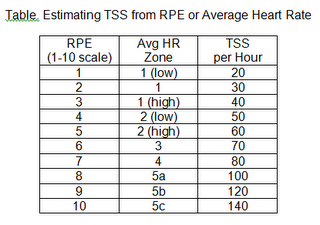 Remember that TrainingPeaks think your maximum TSS for one hour of running is 110. And as you suggested with your chart and I'm sure you know, I'm going to make it explicit - that is one continuous hour, if you take breaks you can do more than 100tss/hour for less time. Thanks guys. As always, loads of useful information! I am going to monitor things like HR, TSS and Watts a bot more closely this year, however, I will bear in mind that they will not always be end of the story. Garmin has something called Intensity Minutes now (for HR activities), but I find it very inconsistent, probably not helped by the wrist HR that I have activated when I'm not using a strap during my actual training sessions. For example, this morning I am up to 299 minutes already, despite only having done a 45 min commute barely going it to Z3. I looked at my watch and it says I'm sat here at 122bpm In fact I've just turned wrist HR off, as it's going nuts. Can someone explain why my run today, 1h2mins 98% in Z1 and 2 on TP has a TSS of 200? My zones appear to be set correctly, MHR and LTR all look correct. Is my TSS very high because my form is currently at -48? my current CTL is 86, which is not very high, it was over 100 from March to September. I reduced training in November and December, and had a couple of weeks of almost no training over Christmas (however, I was doing a lot of walking, just not recorded). I have completed 2 weeks of a 3 week training block, Doing the Tour De Zwift races means I am probably doing a few more zone 4+ sets than planned. I don't use TP as it's just too many different accounts! However, I do know that -48 is properly in a hole, if it's a genuine figure. Normally, you should be backing it right off with a number like that, but the fact you feel 'okay' suggests it's maybe not a true reflection. Lies, damned lies, and statistics! That's what I think too, I am not doing a silly amount of training: 12.5 hours last week, 9.5 hours the week before, I am not training any harder than normal, other than doing some hard Zwift races, on the bike and running, I am mainly doing pretty low intensity work. My running distance of 30-35km per week is consistent with last year, my average running pace this year of 5:03/km is also consistent with the whole of last year. The only change I have made was to recalculate my zones, based on revised LTR, so I wonder if TP has been under calculating my CTL and now thinks that I am ramping up too fast? It's a rolling 6 week average of the daily TSS. If you have 33% of your training for the past 42 days at 0TSS, then it's gonna drop pretty sharp. But TSB would have gone up and ATL down, so it's all good. Also, that 200TSS run for 1hr is garbage. Your running zones, pace, HR cannot be set up correctly.